vegetarianism in Germany – apparently the government is introducing a controversial ban on meat at government receptions. This is on environmental grounds – it seems that in Germany they take very seriously the costs of producing meat vis-à-vis a vegetarian diet. Indeed, from the programme I gather that this is a hot potato (!) in German politics, with vegetarians identified as crazy left-wingers compared with the conservative cattle-munchers. Can you imagine such a debate happening in Scotland? For a start, despite decades of awareness of the issues, there is little high-quality or high-profile public debate on the sustainability of meat-farming. It’s an international rather than merely national issue, as previously ‘developing countries’ increase their appetite for the ‘western diet’ over traditional vegetarian habits; hence an increasing global demand for meat. The meat-versus-veg debate is frequently over-simplified. Scotland has a wealth of high-quality, compassionately-farmed beef, lamb, pork and increasingly, venison – not to mention game birds and the whole of the fishing industry. Apart from the deliciousness of the product, meat’s importance to the economy, and a vast cultural heritage, there are jobs to consider. I’m certainly not in favour of wholesale vegetarianism, imposed or otherwise. But I do go along with the many leading academics, environmentalists, farmers and food writers that we should all be eating less meat; and what meat we do eat should be of high quality. 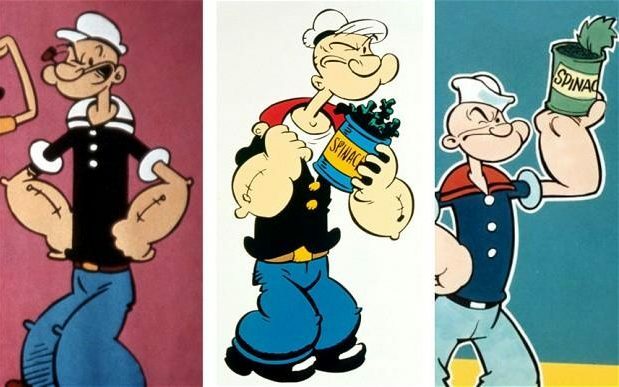 I’m Popeye the sailor man – I lives in a caravan – I fights to the finish cos I eats me spinach – I’m Popeye the sailor man! Secondly, the great fringe benefit in all this is that I get to travel to Dundee at least three days a week (using my trusty bus pass!) and pass some nice foody shops en route to class. Last night I popped into The Cheesery and bought this beautiful ewes’ milk cheese, made in Tain, Sutherland (home of Glenmorangie whisky). We visited Tain last year with a group of friends on a bus pass tour and it’s a lovely wee Highland town with an excellent museum where I thought I found a distant relation who was one of the early Suffragettes. Deep respect! But I didn’t see any flocks of sheep entering the milking parlour. The idea of milking sheep in Scotland is a bit unusual; our sheep are more the woolly-jumper type. Currently the controversy rages on about raw milk cheese, with a strong stand being taken by Food Standards Scotland against Humphrey Errington, Raw Cheesemaker Extraordinaire; and there is massive support for him from the artisan producers of Scotland. How to raise our national culinary standards without taking measured risks? they ask; and I have to agree. Anyway, to the makers of Fearn Abbey ewes’ milk cheese, I drop a curtsey and wish you well, in bringing a gently tangy new offering to the Scottish cheeseboard.